American red raspberry (Rubus idaeus) is native to all of Canada and most of the US. It does not appear in southern states Texas east to South Carolina, and south to Florida, and is unreported in Kansas. There also exist local varieties of red raspberries with limited ranges in North America. Raspberries flourish in sunny areas, but can be found in open forests. Typically they grow along edge habitats, like where the forest meets the field, or near lake shores, creeksides, and riversides. Or along the edge of a fence if you live in the city! Red raspberry is quite easy to identify by its berries. But if picking the leaves for medicinal purposes, they are best harvested before the plant flowers. Therefore, the identification characteristics below focus on the green portion of the plant. Leaves grow alternately on the stalk, and are composed of 3-5 pinnately compound leaflets. The center leaflet is sometimes two- or- three-lobed. The underside of the leaflets are silvery. The stem (or "cane") itself can be erect or arching. It is armed with stiff bristles that are straight to slightly curved. The canes do not root at the tips. Close relative black raspberry (Rubus occidentalis) grows in eastern North America, from Quebec and Ontario, west to Colorado, south to Georgia, and all along the eastern seaboard of the US. Blackberries (Rubus spp.) are yet another species, found across all of North America. Black raspberry plants look very similar to those of red raspberry, but careful observation can discern the two. Black raspberry leaves are typically composed of three leaflets, rarely five. They can be pinnately compound like red raspberry, or palmately compound (like fingers coming from a palm.) Like red raspberry, the leaflets are silvery underneath. More obvious differences are found in the stems, which are strongly arching and readily root at the tip. They are also more heavily armed than red raspberry, with straight or recurved thorns. Blackberry plants can also be confused with red raspberry, but they can be readily distinguished by the leaves and stems. Blackberry leaves are always palmately compound, with 3 to 7 leaflets, typically 5. The leaflet undersides are light green, not silvery. The canes tend to grow upright, and are heavily armed with straight or recurved thorns. 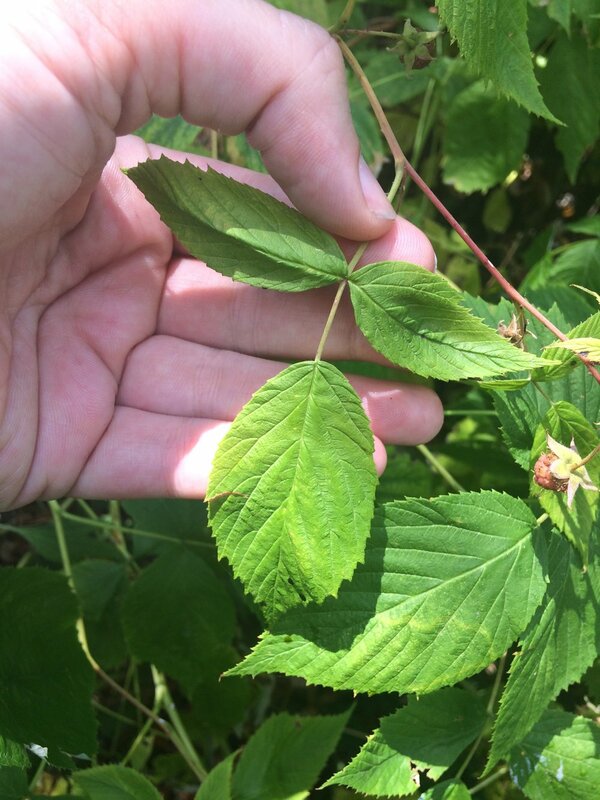 Red raspberry leaves are best harvested before the plant flowers. Pick with thick gloves to protect your hands from the sharp bristles, or use a scissor. If the canes are sparsely armed, you can use bare hands. Take the leaves internally as a tea or tincture. The tea can be made with fresh or dried leaves. To dry the leaves, spread them out in an area with high ventilation and low humidity. Avoid direct sunlight and high heat, as these can damage the active constituents. Once completely dry, store in an airtight container in a cool, dark area. Label with date and contents. Use within a year of the date. To make a tincture, wash and pat dry the fresh leaves. Chop coarsely with a sharp knife. Sterilize a glass jar and pack 3/4 full with the leaves. They should be packed fairly tightly-- not so tight that they can't move it all, but without large air gaps. Fill the jar with a hard alcohol that doesn't have a strong taste, such as vodka. Make sure it's at least 80-90 proof (40-45% alcohol) so it's strong enough to extract the compounds and preserve the plant parts. Run a sterilized non-metal utensil around the inside to release air bubbles. Then label with date and contents and store in a cool, dark place for 6-8 weeks. Strain through muslin into a sterilized glass jar or bowl. Make sure to really squeeze out the last drops of tincture! Transfer to sterilized glass jars, preferably amber-colored. Amber glass protects the tincture against damage from light. Label with date and contents and store in a cool, dark area. Tinctures will stay viable for several years if stored properly. Red raspberry leaf is a much-loved uterine tonic and pregnancy aid. It is a rich source of several vitamins and minerals, including calcium, iron, phosphorus, potassium, and vitamins C and E. These and other constituents tone the pelvic muscles and relax and stimulate the uterus, for a balancing effect. It is generally recommended for use during the entire pregnancy and after, as it prepares the uterus for birth and stimulates the flow of milk. The leaf is also indicated for menstrual pain and heavy menstruation. I personally use it for this purpose, and find it more effective than taking over the counter pain medicine. The high tannin content of the leaf also makes it an effective treatment for diarrhea, excessive bleeding, or other ailments that require a tightening of tissues. As a nutritive tonic, it can treat anemia and strengthen teeth and bones. Red raspberry is a good example of why it's important to learn the whole plant, rather than just identifying it by one or two features. In this case, the leaves make an excellent medicine. (The canes are also edible, but that's beyond the scope of this post!) In the case of other plants, different parts may be toxic. In other plants still, different parts may be an underutilized resource. For example, the flower stems of edible plants are sometimes the best part, but from lack of knowledge are thrown away. But I'll get off my soapbox and let you get outside!